Will South Africa's second largest city dry up on August 19 of this year? 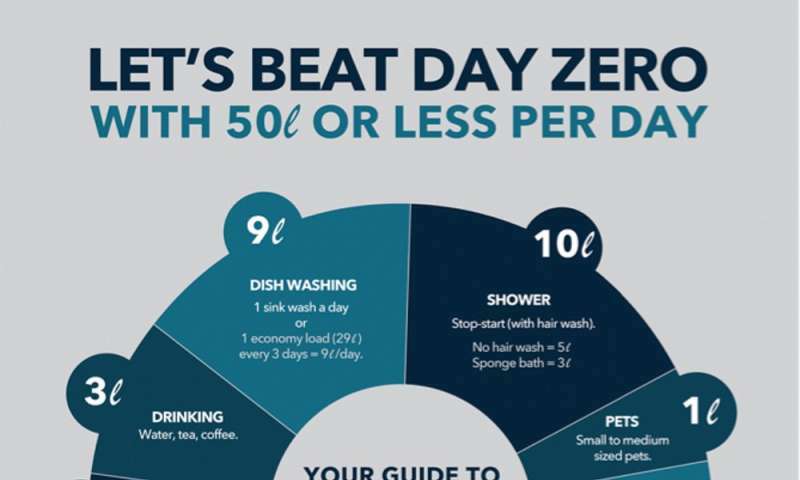 By launching an official countdown, Cape Town City Council wished to highlight the impending cuts to domestic water supply for its more than 3.7 million inhabitants. The BBC then upped the ante, with an online list of 11 cities that may sooner or later suffer the same fate. Since then, a tide of alarmism has swept through the media. It is as if we are suddenly realizing that water doesn't flow from the tap by magic! What is happening in Cape Town? Located on the southern tip of Africa, Cape Town has a distinctly Mediterranean climate. This is why grapes grow so well there. But despite being a boon for winegrowers, that climate is characterized by formidable summer droughts. And with winter ending in the northern hemisphere and summer drawing to a close in the southern hemisphere, now is the time of year when the water reservoirs of Cape Town are typically at their lowest. The city has a total of six reservoir dams to store water from rivers running down from the Cape Fold mountains, east of the city. Their total storage capacity is around 900 million cubic meters (for comparison, the storage capacity of the Grands Lacs de Seine reservoirs, upstream of Paris, is 810 million cubic meters). 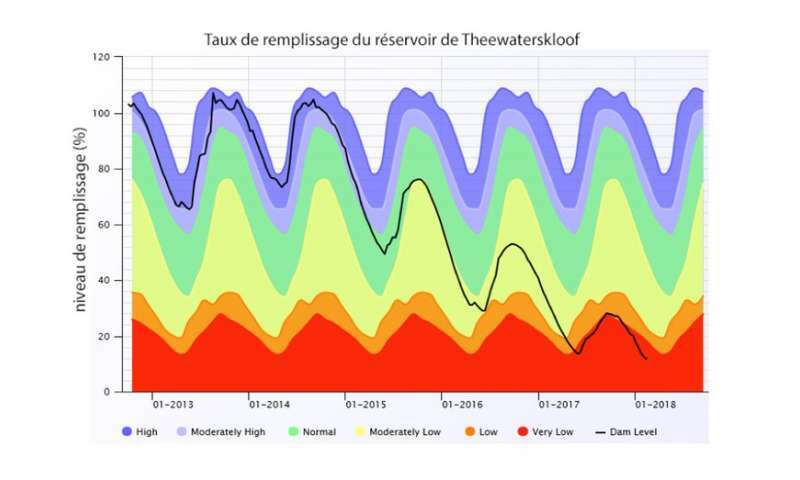 But Cape Town's current problems are far more serious than a simple seasonal slump: a prolonged drought raging since 2015 means that reservoirs have not been able to recover their reserves over the last three winters (2015, 2016 and 2017), leading to a steady decline in water storage rates (see graph below). Only a significantly premature and rainy winter could now prevent a general water shutdown; even then, it is unlikely that water storage rates will rise to secure levels over the course of one season. This extraordinary crisis is clearly due to climatic causes (an uninterrupted succession of dry years), with aggravating factors, such as high sustained urban population growth (+80% between 1995 and 2018) and water sharing between the city and agricultural land. As a matter of fact, the water stored in Cape Town's water supply reservoirs is not only used for drinking water: a third of its volume is used to irrigate the approximately 37,000 acres of vines and orchards that surround the city. At the turn of the century, the council implemented an active policy for controlling water consumption, stabilizing it at the level reached in 1999, in spite of a significant rise in population (see graph below). The loss rate through leakage in the water distribution network is low (around 15%) and waste water is increasingly being re-used, in particular to water parks and golf courses. The City has already made plans for a general shutdown, which is now a very serious possibility. Water would be distributed from 200 sites, where inhabitants would be able to collect 25 litres per day, under the surveillance of the army and police. Looking beyond South Africa's current troubles, we can wonder whether this crisis is local, or global. The BBC published a list of eleven cities with recurring water supply problems; other organizations, such as the World Bank and various scientific journals, have published similar lists. Numerous regions worldwide have experienced water supply crises in recent years. In 2008, Barcelona was forced to ship in water on tankers and, in 2009-10, Melbourne residents lived under the threat of water cuts following an extraordinarily long drought (1998-2010). The same drought also forced Sydney to implement water restrictions, reducing consumption by 20%. In France, the island of Mayotte nearly had to call in the tankers in 2017, following a very late start to the rainy season. 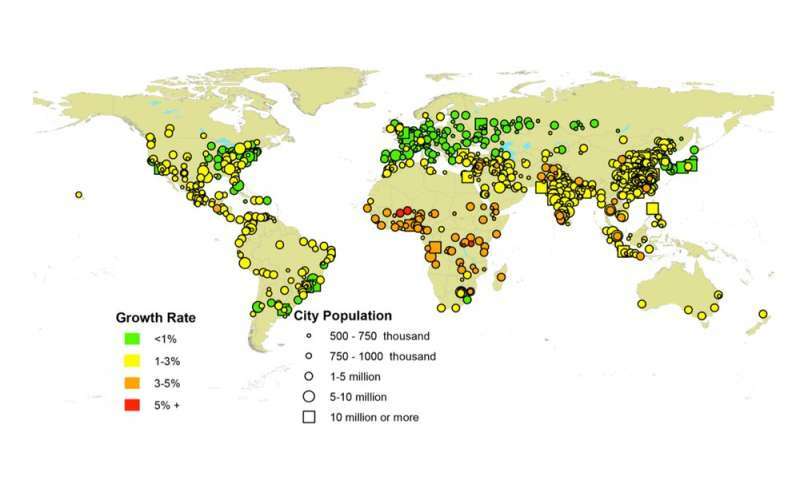 While Cape Town's extraordinary drought may well be considered a local phenomenon, UN demographic predictions for large cities provide little cause for optimism: current rates of population growth in Africa, Asia and North and South America are such that it is clear that water supply will be a major challenge for big cities in the 21st century (see graph below). Fortunately, there is nowadays a wide variety of long-term solutions to avoid city water supply crises. These range from reducing water consumption to increasing water storage and improving the management of existing resources. Change consumption habits: Changing city dwellers' consumption habits is the surest way of avoiding water crises. But sociologist Rémi Barbier stresses that this is no easy task. Over the last decade, the French biodiversity agency has launched a number of studies opening up options to reduce water use. Improve water use management in agriculture: Better irrigation efficiency worldwide is a major step towards water savings. If we reduced the amount of water used for agriculture by just 10%, we could double the drinking water supply. For many years, efforts concentrated on improved irrigation techniques (such as trickle or drip irrigation, which is slowly replacing surface irrigation, where water floods the field). Today, work is being conducted on recycling urban waste water for irrigation. Improve distribution efficiency: We can save large volumes by reducing water losses in water transport and distribution networks. 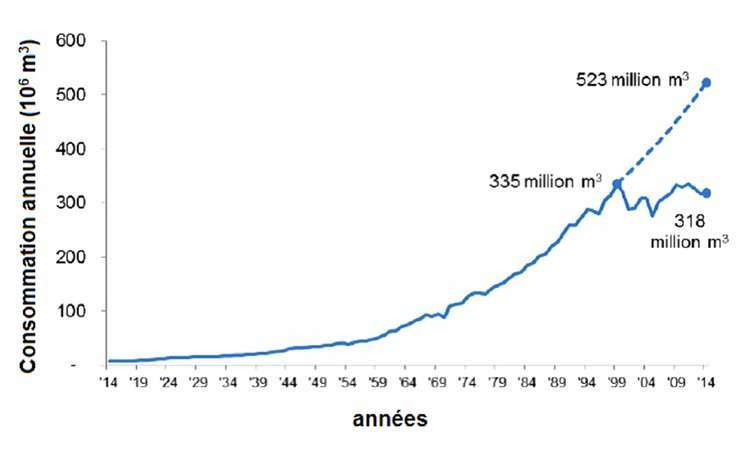 In France, an average of 25% of drinking water is lost to leaks in the network (this reaches up to 40% in places). While this figure is very high, it should be considered in the context of the size of distribution networks (nearly 850,000 km). Locating and repairing leaks is therefore a lot trickier than it sounds and we cannot hope to eliminate them all. It is however possible to reduce their impact by reducing network pressure at night, for instance, so as to limit losses from existing leaks. Improve natural flow predictions: In order to optimize the use of surface water, better anticipation of water flows is necessary. Forecasts – in the short-term for high water levels and in the medium- to long term (from a few days to a few weeks or months) for average to low flows – would enable us to better plan water releases and save water. Meteorological and hydrological models are the main tools that will help us better predict these phenomena. In France, a research program on predicting low water levels (Premhyce) will soon lead to an operational forecasting system. Better manage underground water sources: For large cities that rely on underground water, the main threat to supply is overuse. This is difficult to control, especially because ground water is accessible to a large number of local occupants, who do not always understand the resource they are using. Water management solutions should be adopted collectively: we must control consumption, allocate usage rights and, above all, make sure these rules are upheld by installing meters on wells. One of the solutions often proffered for water shortages is industrial production of fresh water by desalinating seawater (or brackish underground water). Desalination is on the rise in various Near- and Middle Eastern countries, and in Maghreb. In Mediterranean Europe, it is being developed in Spain (Barcelona, the Canary Islands), Cyprus, and Malta. In France, it remains very rare, but the islands of Sein and Houat (in Brittany) have small desalination plants, as does Mayotte. But desalination remains a very costly solution (around €0.50 per cubic meter for very large plants) and consumes a great deal of energy (from 3.5 to 18kWh per cubic meter, depending on the technique used). Melbourne provides an instructive example: the Victorian State government built a seawater desalination plant to supply the city with drinking water. Construction began in 2009, during a drought, when water levels in the reservoirs had fallen to a historical low, but the plant did not become operational until 2012, when the drought had already broken. It did not receive its first order for water until 2017. The current crisis in Cape Town reminds us that water does not automatically flow from our taps. This modern privilege is under threat from climate hazards and the remarkable growth of cities worldwide. Cities will have to seek out water further afield, and will no doubt come into competition with traditional users, such as farmers.